They can all take a heavy toll on your tires’ exterior condition and service life. That’s why it’s so important to have your tires inspected regularly for signs of damage. Of course, if you should ever need tire repair, you can always count on the experts at Smalley Automotive. • A tire repair can only be made between the “tread shoulders.” That’s the tread surface that meets the sidewall. • Puncture damage can only be reliably repaired if the hole is straight through the tire surface (not jagged or at an extreme angle) and 1/4” in diameter or less. • A proper tire repair must include “filling the injury” with a vulcanized rubber plug or the combination of a patch and a plug. The repair must also seal the tire’s inner liner. In addition to stopping the release of air, the plug stops the migration of moisture, and the patch supports the plug. • All repairs must be executed from the inside of the tire. Plugging a mounted tire from the outside is not recommended. • Repairing a tire by using an inner tube or sealant is not acceptable. • When a radial tire has been damaged to the point where the steel cords are exposed to the elements, it must be repaired as soon as possible so that moisture is not allowed to migrate along the belt package and cause further damage. While you may choose to change and rotate your own tires, tire repair is not a job for the do-it-yourselfer. One of the leading causes of tire failure and casing rejection during the retread process is a faulty repair. 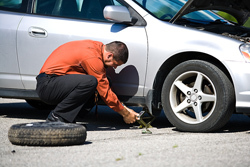 And, according to a survey in Tire Business magazine, 46% of tire failures are caused by improper repair procedures. The experts at Smalley Automotive have the know-how, the equipment, and the professional repair supplies needed to do the job right and ensure the safe operation of your tire. Because tires are highly engineered products made from a variety of materials, they should be protected from overexposure to heat, light, moisture, ozone and deformation while they’re being stored.